This page describes the legacy workflow. New features might not be compatible with the [p,e,t] representation of FEMesh data. [p,e,t] = meshToPet(mesh) extracts the legacy [p,e,t] mesh representation from a FEMesh Properties object. This example shows how to convert a mesh in object form to [p,e,t] form. 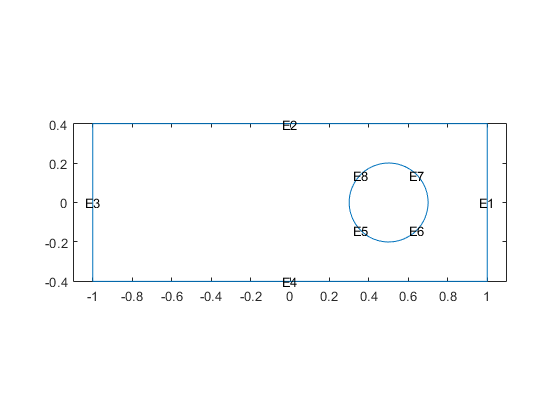 Create a 2-D PDE geometry and incorporate it into a model object. View the geometry. Create a mesh for the geometry. View the mesh. Convert the mesh to [p,e,t] form. View the sizes of the [p,e,t] matrices. Mesh points, returned as a 2-by-Np matrix (2-D geometry) or a 3-by-Np matrix (3-D geometry). Np is the number of points (nodes) in the mesh. Column k of p consists of the x-coordinate of point k in p(1,k), the y-coordinate of point k in p(2,k), and, for 3-D, the z-coordinate of point k in p(3,k). For details, see Mesh Data. 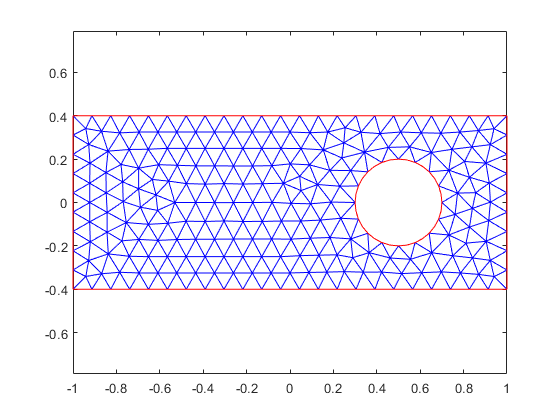 Mesh edges, returned as a 7-by-Ne matrix (2-D), or a mesh associativity object (3-D). Ne is the number of edges in the mesh. An edge is a pair of points in p containing a boundary between subdomains, or containing an outer boundary. For details, see Mesh Data. Mesh elements, returned as a 4-by-Nt matrix (2-D with linear elements), a 7-by-Nt matrix (2-D with quadratic elements), a 5-by-Nt matrix (3-D with linear elements), or an 11-by-Nt matrix (3-D with quadratic elements). Nt is the number of triangles or tetrahedra in the mesh. The t(i,k), with i ranging from 1 through end - 1, contain indices to the corner points and possibly edge centers of element k. For details, see Mesh Data. The last row, t(end,k), contains the subdomain number of the element.